I picked the heads up today. Because i ported the heads with the old valve seats installed, then after got the new seats done after, i have a little bit of re-work to do in smoothing the transition between the bowl and seat. Then i can take the heads back to the shop for facing. Heres a little shot of Neil cutting the seats when i went to pick em up this arvo. Looks like i may need to convert to a shim under bucket cam follower / valve lifter. I knew the lifters would need to be sized and potentially have to buy a few more to achieve the correct clearance. I didnt realise that they would be so far out of OEM range that none of my current selection even come close. And even potentially outside of the range that Subaru produce. The installed hieght of the valves is a fair bit different to my previous heads. The intake valve buckets need to be shorter than my shortest bucket by quite a ways. (I have no way of accurately measuring how much with my current selction of lifters) as they are all too long and therefore have "negative" clearance. And it looks like exhausts need to be longer than my longest buckets by about 0.4mm to achieve desired clearance. 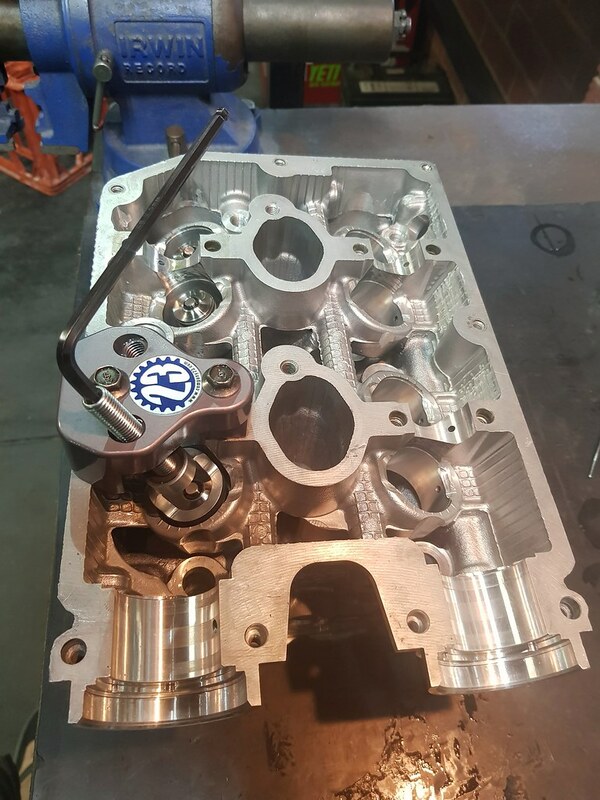 This is because the new valves are potentially different sizes to previous, different cams are potentially differnt thickness at non-lift area. But probably mostly because the seats have been cut, and that affects the valve installed hieght. I have no idea if this means the seats have been cut badly. Or if it is simply the way it is when seats get cut. Given that the seats are new, then i would presume they could be cut close to the OEM size. But i have absolutely no experience in this, or know how easy/difficult it is to cut a seat to the correct hieght range accurately. But I can obviously understand if cutting old sests, then they HAVE to change the installed hieght as you have to remove material in order to cut. Unfortuantly, once material is cut off, it cannot be added. All my shimless bucket follower/lifters that i have in my collection are all sized around 5mm give or take around 0.1mm. Thats approx stock sizing from both sets of heads that i have pulled apart. 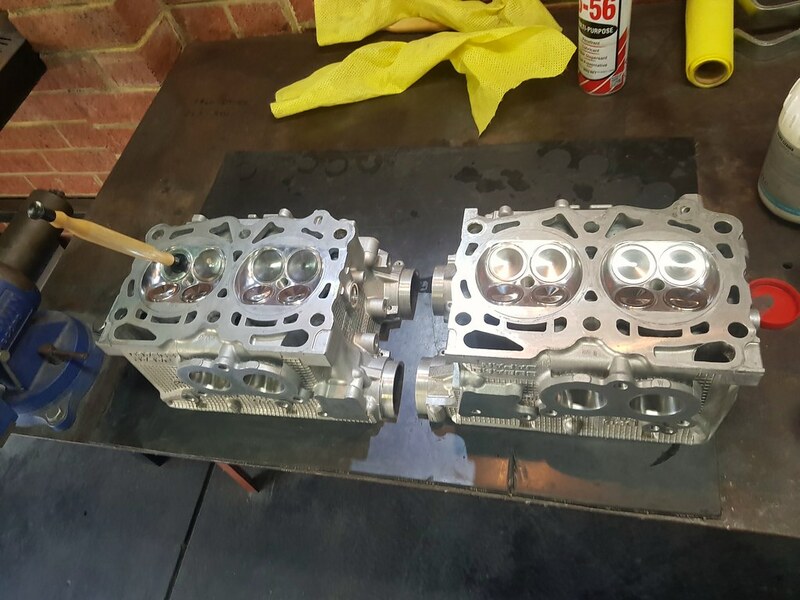 And i would say what Subaru aim to achieve when manufacturing the cylinder heads. I have ordered a couple of OEM shimless buckets from Partsouq. I ordered a couple of sizes at the low end of the available spectrum of OEM sizes. And a couple at the tall end of the available sizes. This will allow me to hopefully check the current setup and then determine whats needed to properly set clearances. Tipping the valves is not something i want to do (or even can do on the exhausts as the clearence is already too large). And is out of the question unless all else fails. So my 2 options are persist with the OEM shim-less style and hopefully they are available in the sizes i need. Or to buy the shim-unders and shims. And run with that. 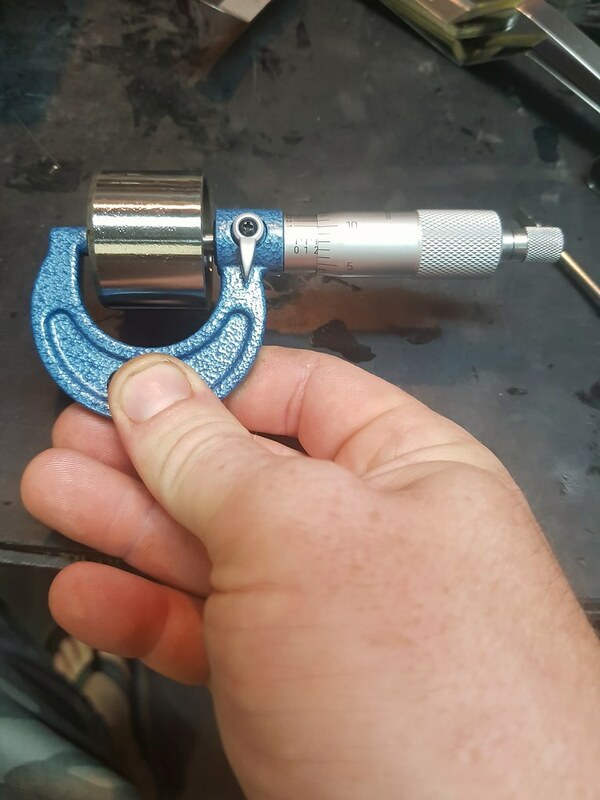 The shim unders probably make more sense as once purchased, its only shims that need attention, and that makes subsequnet sizing and adjusting all the more easier. 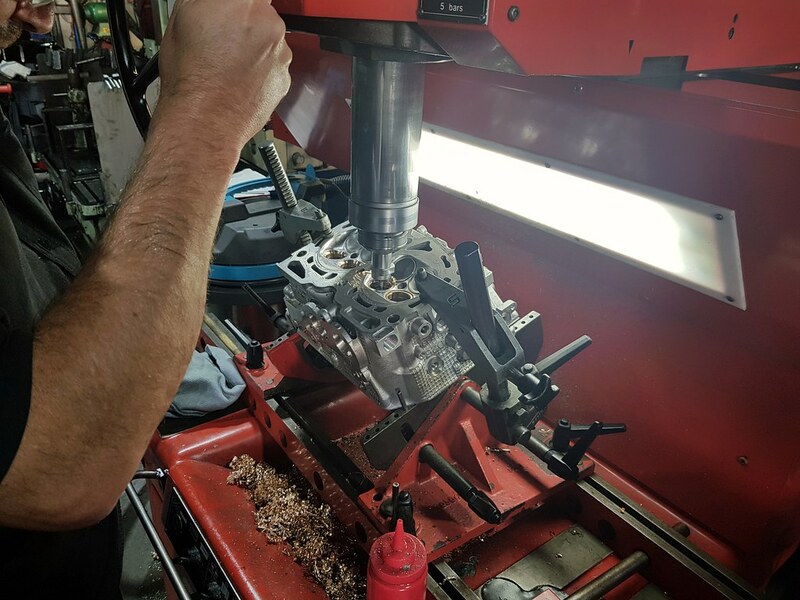 Another thing to consider is you can set up a head on the bench and get it perfect, then once you fit that head and torque it down, the head moves around and you have to re-adjust everything. I can see this being super frustrating when using shim-less buckets. I personally like the idea of shim-less lifters, as they are actually lighter than the shim-unders by a gram or 2. And there is less moving parts. But i can totoally see how they become a head ache to set up, especially at non standard valve heights. And then need to be replaced again at future adjustments. OEM buckets are about $14usd a piece from Partsouq, where as the cheapest i can see the Supertechs is $20usd. Plus $3usd for shims ontop of that. Not that money is a concern on this build. Another thing to consider is the valve spring seat length. 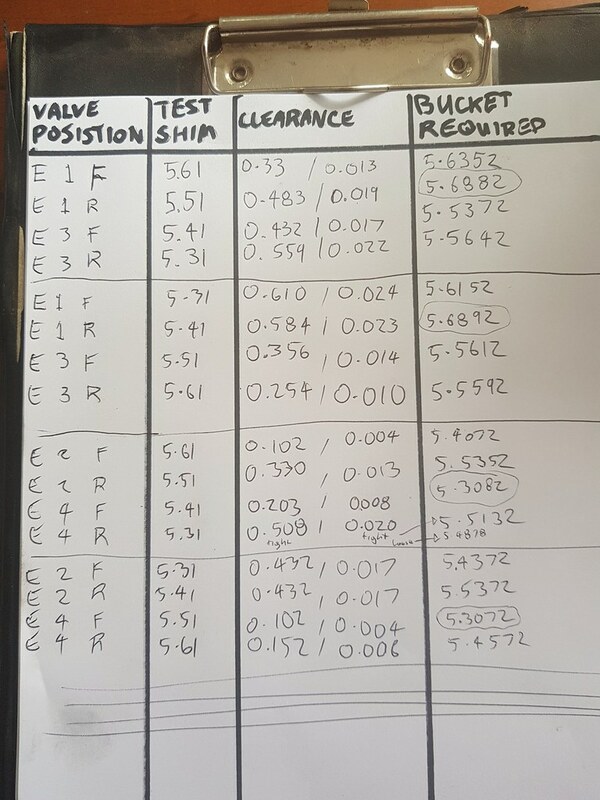 When the valve installed hieght changes, then the amount of compression on the spring at valve seat changes aswell. Given that the intakes are sunk significantly deeper into the head, then i should probably get thicker shims to compensate for the longer spring length at installed hieght. The exhausts will actually have more spring pressure on them with thier valve installed hieght. So aslong as this doesnt put the springs into bind, then should be ok. Spent a bit of time hand lapping the valves in today. I used some engineers blue and checked the contact patch and a few of the exhausts had less than ideal seat patterns. 20 seconds or so of lapping fixed them right up. Lapping is very easy, but so much care must ve put into clean up during and after. Lapping compound is basically a bunch of diamond abrasive in a paste. And you dont want diamonds left inside your engine. So constant cleaning at every step of the process. And diligent disposal of any rags contaminated with the paste. Then thourough cleaning after. Here is an example of the seat contact patch of the valve. You can see where the blue ink has been taken off. My favourite thread on OzFoz at the moment. Thanks for the content Bram!! Also tapping and plugging the AVCS drains inside the front cam cap/bridge. The holes are the perfext size for an M8 tap. 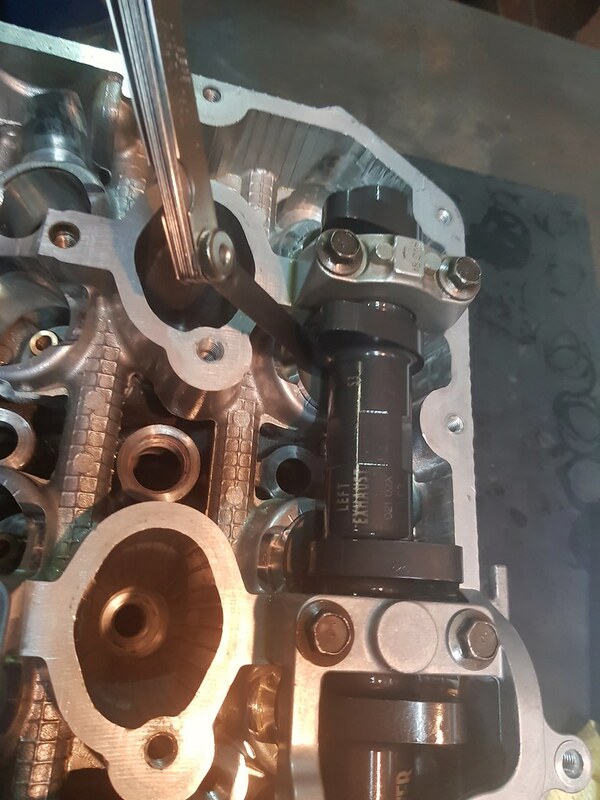 In order to diasble the AVCS in the cylinder head. You plug these 2 drains from the valve assembly. Then turn a plug on the lathe to accept an O ring just like the original solenoid valve unit. That plugs the hole when the solenoid is removed. And the M8 screws direct oil directly to the journal bearing. Not concerned about throwing a shim? I know its a rare occurrence but would be devo if it did. Dont know what Neils level of experience is with subi heads but maybe a quick phone call to Tony Knight to get his take on it. Would think he would of come across this problem before and would have some sort of advice. Yeah. I personally am more inclined to correctly size shim-less lifters. I dont think the sizing needed will be outside of what subaru make in shim less buckets. I dont know how much of an issue spitting a shim out is. I dont think its actually something to be too concerned with. And the type i have been advised to get arent the OEM shim under lifter anyways. (Or shim over for tgat matter, which i think is what has the problems.) And its an EJ, not an SR with those janky shims under the rocker arms. Totoally different to Subaru applications, but alot of the very high revving sports bike use shim-under lifters. I think it cones down to ease of adjustments more than anything else. I believe Neil (Neil Herbert @ engine shop) opinion is based on is ease of set up. The shim-unders are much better in that regard. But for me, where time isnt really a concern, i dont mind waiting for additional buckets to come from subaru if i need different sizes etc. Or order the wrong size and need to wait again etc. I have faith in neils skill as a subaru builder. He himself has a pretty mental GC8 that he campaigns at the local rally sprints and such and does alright with it. He is also one of the only guys organising close decking in the state. I might have made it sound worse than it is in my other post. Im pretty sure i wont HAVE TO use shim under because the valve installed hieght is out of OEM range. Its just out of the range of shims i have in my collection. Which is just 2 stock engines worth at this stage. My range of buckets in my collection is from 4.89 to 5.11. Subaru make them from 4.38 to 5.6x i think. I need about 0.4mm more for the exhaust. So should fall within OEM range, and using verniers to meausre (not that accurate) i think i need about the same the other way for the intakes. So hopefully still within the OEM range/tolerences if i decide that way. As said, i have ordered some tester buckets from Partsouq, that i can use to measure the intakes precisely. My tester valve lifters have arrived from Partsouq. I have began testing clearances properly. Using brand new, un-worn lifters. I bought 4 sizes to test the exhaust. And 4 sizes to test the intakes. That allows me to set one cam up at a time. 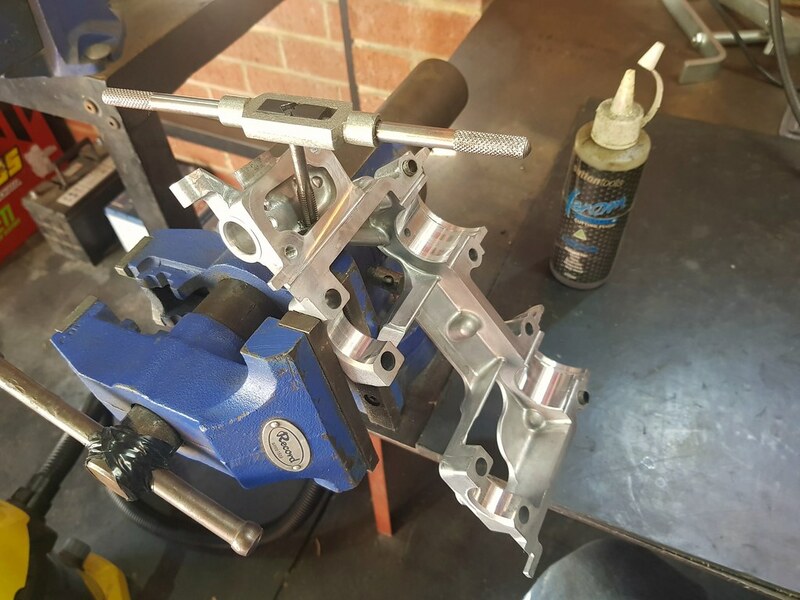 Rather than constantly swapping buckets to test each valve clearance along one cam. What i did was set up one head at a time. Installing my valves in thier correct posistions as they were lapped. I put the springs and retainers on using this handly tool from company 23. Its a easier to use the company 23 tool than my other spring compressor. Only gripes with the Company 23 tool - they only give you 1 threaded stud push rod. So you are forever swapping the stud from one side to the other. The stud cant be worth more than a dollar or so, so it is very dissapointing that they only give you one, when 2 is needed. It would be nice if they included the bolts to secure it to the head aswell. You have to use the Subaru originals, but they only give you a few turns of thread engagement, and i worry its not enough for very heavy springs. On the plus side, they do include a handy magnetic pickup tool aswell. But i think a set of tweasers would also be very usefull aswell, and cheap. I raided my 1st aid kit and found some nice surgical style long pointed tweasers which work brilliantly for installing the keepers. Apart from those minor issues, the tool is great and works very well. Once the valves and springs installed, i slipped in the lifters, and bolted the cam and caps down. Then using the feelers i measured the clearances. Because i had 4 different sizes between 5.31 and 5.61, I did the test, then swapped the 4 lifters around, and did the test again. I laid the info out on a spread sheet (by hand LOL), and this gives me enough info to work out what size lifters i need to order for the final setup. Out of the 8 exhaust valves. I had 1 that requires a lifter that Subaru does not make. 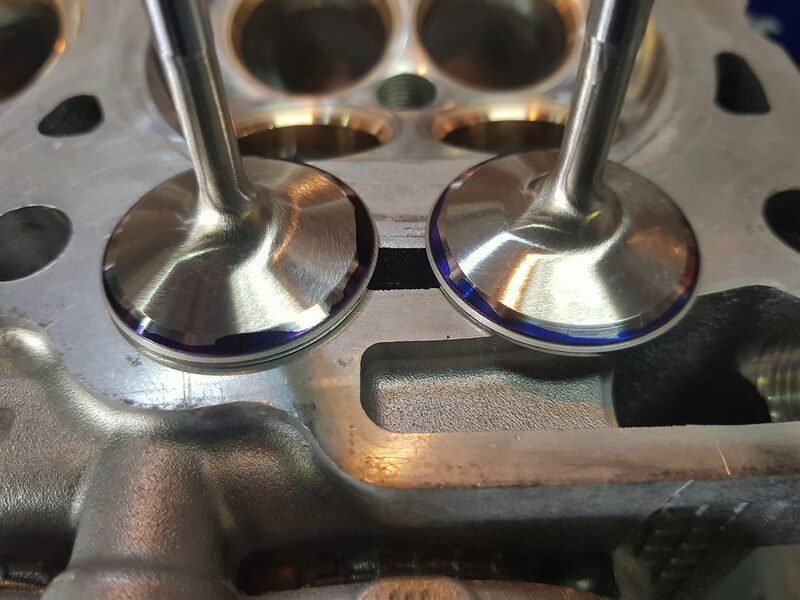 The other 7 exhaust valves can use OEM lifters. I have tried swapping the valves location about and it doesnt look like I can get the last valve location into spec. I had tried this earlier, before I bought the test shims, and thought i could swap, but after re-testing, i dont think i can now. I will attempt lapping the one out of spec valve location and see if this will bring it into spec. But first i will measure all the intakes and see where they stand.